Invoicing can be a pain, especially if you’re a freelancer, as your strength may be in writing, designing or web development, and not in accounting. Managing this manually will probably give you headaches, particularly when you are pressed for time to meet deadlines. Unless you have the budget to get your own accountant, it’s time you start looking for a tool that can cater to all your invoicing needs. To that end, let us introduce to you Billbooks. Billbooks is an online, cloud-based invoicing service that helps you create, send and manage your invoices and on top of that, help you monitor your finances. It has a number of great features and a great pricing structure that’s geared towards freelancers and small startups. Let’s take a look at Billbooks and what it has to offer. Billbooks is a cloud-based online service that helps you manage your company invoices. Instead of the regular social network sign-in, registering requires your company name, your name, an email address, a domain name and a password. Upon registration, you will be taken to the main Billbooks interface. The menu bar on the left side of the dashboard lists out the four types of items you can create in Billbooks. Billbooks supports keyboard shortcuts to navigate between these four items, namely Invoice (I), Estimate (E), Client (C) and Expense (X). You also have access to list views for all of these, where you can manage and edit items. 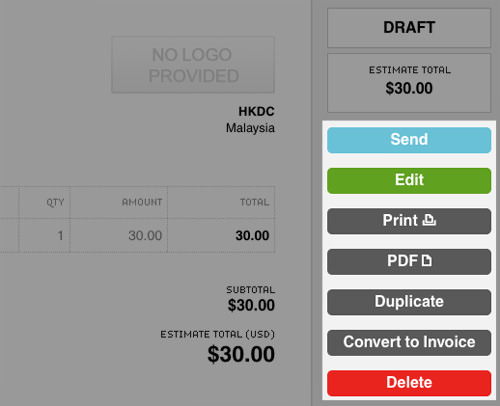 Let’s first take a look at how to create and manage your invoices. 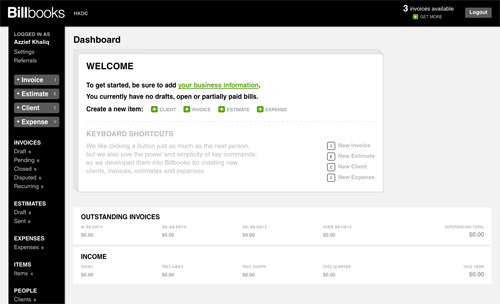 Billbooks’ New Invoice screen is a complete invoice creation tool, with all the fields you’ll need for a proper invoice. You have the ability to specify the invoice recipients (on both your side and the client’s side), title the invoice, as well as add new lines, items and taxes to Billbooks. There’s also a Quick Settings side panel where you can customize the currency, due date, whether the invoice is recurring, and whether there are any freight charges or discounts applicable to the invoice. Invoices are categorized into Draft, Pending, Closed, Disputed and Recurring. You can move an invoice from one category to the next from the sidebar in the invoice view, such as Make Pending in the Draft invoice view. 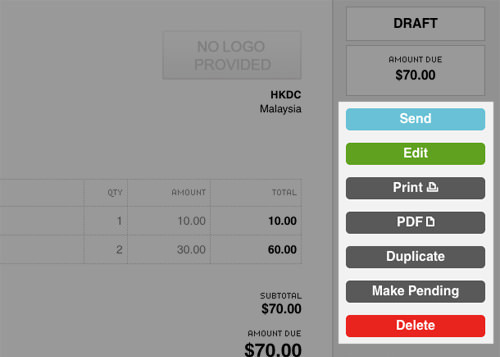 This is also where you can Send, Edit, Print, Duplicate and Delete draft invoices. Do note that ticking the Recurring option in an invoice’s Quick Settings sidebar skips the Draft stage and sends the invoice directly to the Recurring category. If you need to track the history of your invoices, there’s a History section, which shows when an invoice has been edited. If you need to send estimates (or quotations), this is where you create them. The New Estimate screen is almost the same as the New Invoice screen, with a few differences. There are fewer options in the Quick Settings side panel and a different set of sidebar options when you view the estimate. Estimates aren’t categorized like invoices; you only have Draft and Sent categories for estimates. 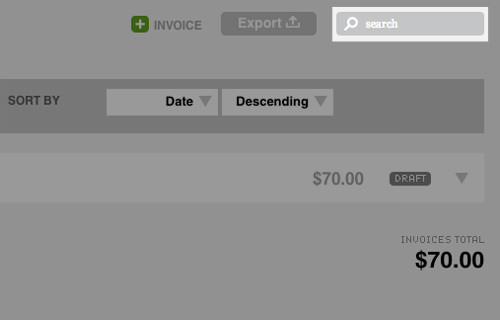 The sidebar thus looks a bit different, with a Convert To Invoice option in place of Make Pending. Don’t worry if you have a lot of invoices and estimates to manage. Billbooks has a live search feature that lets you search through your documents quickly. There are also quick preview options, accessible from the downward-facing triangle to the right of an invoice or estimate. 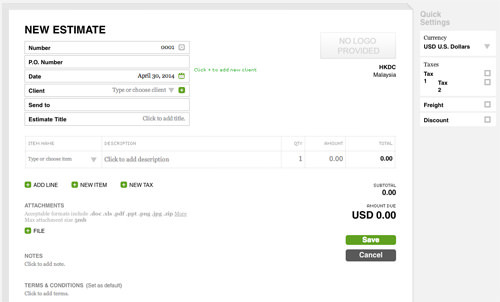 This quick preview lets you have a quick look at the invoice without opening it. Done with an invoice or estimate? Then, send it out via email. Billbooks even lets you attach files to your invoices and estimates. It also supports formats such as DOC, XLS, PDF, PPT, PNG, JPG and ZIP. There is a 5MB file size limit for the attachments. 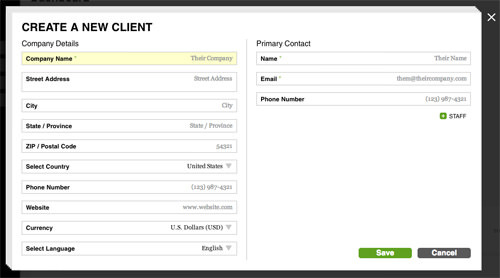 You can manage your client accounts via the client option. 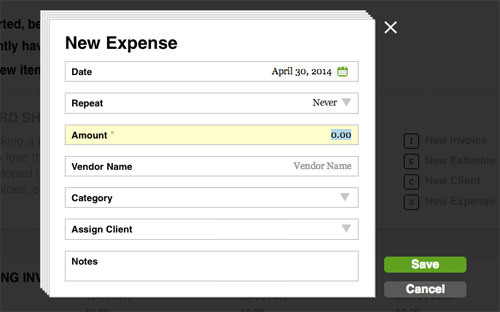 The Client button will open a floating window for creating a new client for your invoices and estimates. At this point, you don’t have to fill every field up. Billbooks only requires a company name and the contact details of your primary contact. However, it’s good to fill all the information for record-keeping purposes. Billbooks’ multilingual support comes in handy here, as you can select the language you want to send invoices in based on your client’s preferences. Supported languages include English, Dutch, Spanish, German and French. Like the Client option, the Expense option opens a floating window that lets you create a new expense, for Billbooks’ expense tracking and reporting capability. You can also categorize these expenses and assign them to particular clients, if applicable. If you want to view all your expenses, you can click on Expenses in the left sidebar. This will take you to your Expenses view, where you can filter and sort your expenses by date, client and category, amongst others. You can also edit and create new Expenses here. Lastly, Billbooks has a special section on generating profit and loss reports for your company. It isn’t the most comprehensive tool available but then again, it is not a common sight in invoicing applications. You can choose the report period, either yearly, half yearly or quarterly. You can also set an ending date for the report, and choose to see either Cash Based or Accrual revenue. The report can then be downloaded in PDF or exporte in either Excel or CSV formats. You can also print the report directly from your browser. Billbooks supports many payment options which is good news for both you and your clients. Under Payment Method, you can link your invoices to payment services such as PayPal for online transfers, and Stripe to receive credit card payment. Of course, you’re going to need to have an account with any of these services before you can integrate them into your invoices. Integrating any of these services into your invoices adds a Make Payment option, which customers can use to make their payments. All in all, Billbooks is an incredibly useful service but is not without certain limitations. 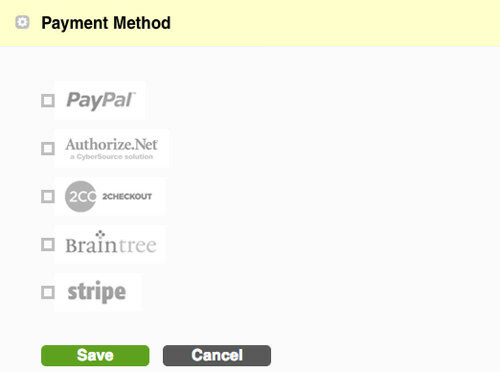 For instance, you can’t create your own invoice layout, and can only choose from a few preset templates. The recurring invoice feature isn’t all that flexible either, with preset timeframes that you can’t tweak to suit your needs. Nonetheless, one of the best things about Billbooks is its pricing system: there are no monthly or yearly subscription fees to pay. Instead, you buy a prepaid bundle of invoices. Prepaid bundles start at $10 for 20 invoices up to $60 for 200 invoices. 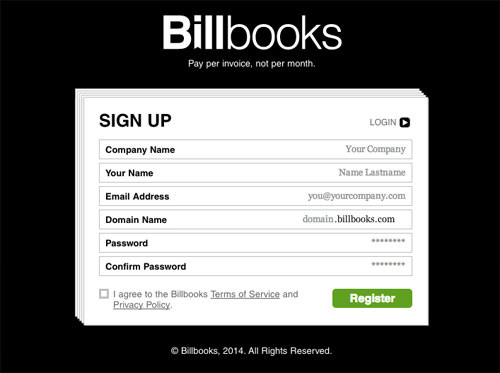 Upon first sign up, you also get 3 free invoices to try out Billbooks. Estimates don’t count towards your prepaid invoices so you can create as many estimates as you like and will only be billed when you send out your invoices.